[0:14] <new2013> new r.pi user here. i have a question. [0:15] <SpeedEvil> how do I change the console text resolution? [0:17] <new2013> Have installed mcp7941x real-time clock. Next installation step says: "echo mcp7941x 0x6f > /sys/class/i2c-dev/i2c-1/device/new_device". I sudo this but get "Permission Denied". Fix? [0:21] <AndrevS> also keep in mind the i2c-0 and i2c-1 have been swapped between the first and second revision of the pi. [0:22] <new2013> Hi AndrevS. Swapped? Is the r.pi version B i2c-1? [0:23] <new2013> The path I've given is what's documented and it does exist. I just did sudo chmod 777 and wrote to it. Not sure if that's best practice. [0:33] <new2013> AndrevS, I have 512 MB RAM. Your using Arch explains it. I have Raspbian here. "sudo chmod 777" appears to have been the right step. [0:33] <new2013> Your using Arch explains the difference in the path, I meant. [0:35] <new2013> I bought the RTC through EBay from a chap in Ontario. Documentation is poor. I will send him the changes. Thanks for your kind help, AndrevS. [0:35] <AndrevS> I got some RTC from dx.com. I thought I had written about it on my blog... but appearently I haven't written about it yet. I should do so. [0:36] <AndrevS> But first I am resolving some other issues, I assume are power adapter related. [0:36] <new2013> Do you need me to send you my steps or do you know everything by heart? I liked Arch for learning, but the rolling distro model wasn't good for my use. [0:37] <AndrevS> I had it working before. I might still have the notes. but I need to set it up again. [0:39] <new2013> The vendor for my chip is www.100randomtasks.com. [0:40] <AndrevS> but now my laptop appears to be trying to stop me. [0:40] <new2013> Here's the doc that I found that helped a little: http://www.circuitsurgery.com/docs/rtcc.pdf. No one mentions needing to chmod the dir, though. [0:42] <new2013> What make is the lappy? [0:44] <AndrevS> It seems, it doesn't write *anything* to the SD card. But I will get a new one next month. [0:46] <new2013> It has an HD screen? Glossy or matte? I hate glossy screens. Wait a few more months for the Haswell i7s to make it into notebooks. [0:46] <new2013> Oh, one more question about the r.pi... there's a pseudo-hwclock that I saw during boot. Is this disabled automagically if the chip is detected? [0:46] <AndrevS> So do I. It's matte. [0:48] <AndrevS> Well... I haven't seen this pseudo rtc. last time I was playing with the rtc, few months back, it went like "setting clock : error /dev/rtc0 not found"
[0:49] <AndrevS> so, it there would be a fake rtc, it would be /dev/rtc0 and the real one would go /dev/rtc1. But I think that would be strange. [0:56] <new2013> I have seen it at every boot. Perhaps a Raspbian thing. [1:00] <new2013> I do see a /dev/rtc0. [1:01] <AndrevS> before doing the echo > new_device ? [3:48] <EchoFox> that over my head. [4:05] <Aivaras> what is not normal SD card? [4:29] <RahulAN> Aivaras: i meant to say that the card which we normally use in mobile phones can be used or not..?? [4:29] <Aivaras> well, yeah. But you need adaptor because of size difference. [4:30] <RahulAN> yeahh i hav adapter..
[5:17] <zsentinel> has anyone controller a stepper motor with a rpi? [5:35] <PfhorSlayer> I'm looking to get a JTAG interface for debugging my kernel - can anyone recommend me a good one? [6:15] <jasongeng> Hello, I have compiled the latest version of omxplayer. It plays well but I cannot control it with keyboard as before. Any advice? The omxplayer build is Build date: 15/09/2013 22:00 CEST, Git version: 3e8d718. [6:18] <jasongeng> Hello, this is the first time I come here. Seems nobody around here. Is it always like this? [6:19] <PfhorSlayer> People are here. [6:20] <jasongeng> Anyone compiles omxplayer recently? [6:20] <jasongeng> My compilation doesn't work for keyboard control. Anyone has similar issues? [8:34] <Jusii> do you have dbus installed? [9:25] <Nefarious___> if I try to "ip add -blackhole <ip> the rpi crashes. what's happening? [9:46] <superdump> i'm just wondering if there's anything special about the NOOBS installation of raspbian / openelec / raspbmc ? [10:52] <BlackBishop> Anybody using their pis to encode to something the GPU supports hardware encoding (av1/mpeg2) ? [10:53] <BlackBishop> using ffmpeg ? [11:06] <BlackBishop> is that cli based ? [11:26] <superdump> reduced bitrate, but why? [11:39] <Xark> EpixP0ison: Hmm, perhaps "uptime" in combination with "cut"? [11:40] <Xark> EpixP0ison: So you want something similar to the % at the top of top (but not loadavg, which shows >100 when swamped). [11:45] <BlackBishop> nvm .. I forgot that I've passed it -vcodec copy ..
[11:49] <superdump> over the web or on a lan? [11:52] <BlackBishop> the ion is faster ( ofcourse ) then ..
[11:53] <EpixP0ison> Xark any ideas? [11:54] <Xark> EpixP0ison: Well, you could parse the percentage from top, but I bet there may be another way to get it that is more efficient. [11:57] <BlackBishop> I'm not using an asrock 152d I have for a couple of years now ..
[12:02] <superdump> also, why do you have to transcode on the rpi? [12:05] <Xark> EpixP0ison: It is easy to "throw away" the info you don't need (see "cut"). [12:06] <Xark> EpixP0ison: (perhaps in conjunction with "grep" to toss the uninteresting lines). [12:14] <Xark> EpixP0ison: Well, that works on my Linux machine (x86 though, RPi is not handy). [12:14] <Xark> EpixP0ison: It is "fragile" to the exact versions installed. [12:17] <SpeedEvil> awk is a pattern ,matching language, no need for grep. [12:18] <SpeedEvil> EpixP0ison: would loadavg*100 work? [12:38] <new2013> Have r.pi rev B running raspbian. RTC installed and working but OS does not use it at boot. Have edited raspi-blacklist.conf, /etc/modules, /etc/rc.local. Have removed pkg fake-hwclock. [12:39] <new2013> What step have I missed? [13:19] <Peetz0r> Hi! Howcan I play video files in a seamless loop (using omxplayer)? [13:22] <Peetz0r> okay. Should I compile on the Pi, or on my laptop? [13:22] <Peetz0r> an where do I actually start? [13:24] <Peetz0r> how much time does compiling on the Pi actually take? [13:41] <scottstamp> ugh. My Raspi's performance is absolutely abysmal for some reason! I think it's my stupid crappy SD card. Is there an easy way to boot from an External HDD? [13:43] <scottstamp> I know I need some form of SD card in there. Could a 2GB cut it? [13:44] <scottstamp> I'm kind of a noob to this. I know how to dd images to my devices and such, but not a lot else to be honest. :( Are there any popular tutorials? [13:48] <ShorTie> have you check the forums ?? [13:51] <scottstamp> ShorTie: Fair enough. I'll dig. Thanks. [13:51] <mrmoney2012> building a point and click camera.. with a screen on it ! [14:00] <BlackBishop> davor: my dslr has a "point and click" mode ..
[14:10] <mrmoney2012> chow do I do that ? [14:14] <mrmoney2012> just have to get my head around it. [16:51] <mavrikiy_rvachka> hey guys! i've been trying to connect raspberry to my pc through UART with putty or minicom. i've already get rs232 (3,3 V) signal converter and attach it to correct pins on my board. also, i deleted all references to ttyAMA0 in cmdline.txt but still i have nothing on my minicom console. could somebody advise me what i have to do next? [16:53] <pzp> can anyone recommend a wifi dongle for my pi? [16:54] <mavrikiy_rvachka> hey guys! i've been trying to connect raspberry to my pc through UART with putty or minicom. i've already get rs232 (3,3 V) signal converter and attach it to correct pins on my board. also, i deleted all references to ttyAMA0 in cmdline.txt but still i have nothing on my minicom console. could somebody advise me what i have to do next? [16:57] <Jeebiss> pzp: I bought a AirLink AWLL5099 of of eBay and it works great. [16:58] <pzp> Jeebias: how much? [17:05] <Jeebiss> the old addage, 'you get what you pay for' comes to mind. [17:20] <Tonbi_v6> you wanna restore img to small size SD? [18:50] <gog> any way to be certain? [18:50] <gog> other than hooking it up and seeing what happens? [18:58] <PfhorSlayer> Anyone have a link or any info about the clock registers? [19:10] <PfhorSlayer> Awesome, thank you! [19:10] <PfhorSlayer> How did I never find that list before? [19:12] <PfhorSlayer> Thank you again! [19:17] <knob> Hello everyone. I am playing with a rPi here, and a sript uploads a file via ftp. It was working fine with ethernet cable. I just installed a wifi dongle, and it connects fine to the wifi network. Yet now, the rPi can't find the ftp.WEBSITE.com address. [19:17] <knob> Any idea what could be going on? [19:17] <PfhorSlayer> DNS doesn't work maybe? [19:18] <gordonDrogon> have you tried some basic diagnostics like host/ping/etc. [19:19] <gordonDrogon> unlikely. they use geo ip routing. different in every country. [19:20] <knob> Would it be in my rPi's linux side, or router? [19:21] <pksato> knob: how rpi wifi get ip? manual, dhcp? [19:21] <pksato> same route when ethernet was connected? [19:22] <knob> Mmm... from the traceroute? [19:22] <knob> want me to do that test? [19:23] <PfhorSlayer> Do you have other devices connected through WiFi that work? [19:26] <pksato> dont have line starting whit default? [19:26] <knob> mmm... in that command I just ran? [19:26] <pksato> ok, dont have a default gateway. [19:27] <pksato> you use /etc/network/interfaces ? [19:29] <pksato> if ssh, you can lost terminal access for while. [19:30] <pksato> knob: wifi and ethent have same gateway, when you remove cable, lost it. [19:51] <Kymru> bypass password maybe? [19:51] <PfhorSlayer> for the clock sources, what are the frequencies of PLLA, PLLB and PLLC? [19:52] <PfhorSlayer> is that correct? [20:10] <PfhorSlayer> but I can't without knowing what those PLL sources are clocked at... which registers would you need output? [20:14] <PfhorSlayer> what is A2W? [20:44] <PfhorSlayer> I'm assuming that the PLLD on the register listing is actually supposed to be PLLB? [20:45] <Vanfanel> Have you guys been able to enter FinalBurn Alpha service mode in games?? [20:45] <Vanfanel> It says "L+R+SELECT"
[20:47] <PfhorSlayer> what do the mul values mean then? [20:47] <PfhorSlayer> flag bits and such in the upper part of those registers? [21:15] <kraptv> Hey everyone. I got annoyed at a lack of a script that gave a summary of the hardware configuration of the raspberry pi. [21:15] <kraptv> so, I wrote one. anyone here with a Model A that can test it out to see if the detection is appropriate? [21:16] <kraptv> I'd like some others to give me some feedback. It's a work in progress. [21:17] <kraptv> Anyone willing to take a look?? [21:17] <kraptv> I guess I could post on the web forum. [21:25] <gordonDrogon> lost the magic smoke? [21:25] <Vanfanel> PipeDale: Are you sure it's not the SD card? [21:26] <kraptv> you will see both the script and the sample output. [21:31] <kraptv> XpineX: what do you see when you do "df -h" on the system where it was funky? [21:31] <shiftplusone> XpineX, that's a problem with your pi. Looks like a firmware issue. Though kraptv's script should have a way to enture VC is properly initialized. [21:32] <shiftplusone> XpineX, did you run rpi-update at some stage or mess around with the kernel and modules? [21:33] <kraptv> XpineX - hmm. does doing a raw "fdisk -l /dev/mmcblk0" work? [21:34] <shiftplusone> XpineX, there's your problem. [21:34] <kraptv> XpineX - yeah. I need environmentals to be reported as root. [21:35] <kraptv> I suppose I could make a dumb complaint at the top saying "I need this as root, sir"
[21:35] <shiftplusone> again, this is a firmware issue... nothing to do with kraptv's script. [21:36] <shiftplusone> Well, I wouldn't put it in those terms, since than would get me kicked, but yes. [21:36] <XpineX> shiftplusone, do you know of an "easy" fix or should I just re-image ? [21:37] <shiftplusone> XpineX, do you need to use rpi-update? are you testing the next branch or anything like that? [21:38] <shiftplusone> XpineX, I would try reinstalling the firmware, kernel, modules packages. I don't know what the names are in raspbian. [21:38] <kraptv> I've now updated it to check if uid root is happening. [21:38] <shiftplusone> search the repo for raspberrypi, I think. [21:38] <kraptv> does that mean that raspbmc is running as default uid 0 ?! [21:41] <kraptv> Also made a note to have bc installed on the system. [21:41] <kraptv> XpineX: can you "apt-get install bc" on your raspbian system? [21:41] <kraptv> as root of course. [21:44] <shiftplusone> XpineX, if you got that output, I was wrong. [21:48] <kraptv> Really cool. thanks for this! [21:48] <kraptv> You've cranked down the GPU down to 16MB on that system, are you running it headless? [21:49] <kraptv> Alrighty. I hope this is helpful. [21:49] <kraptv> temperature, serial numbers, memory / disk summary, voltage, etc. [21:50] <pvr> Hi, any experiences with buliding for the r-pi via yocto/oe? I built the rpi-basic-image, and I saw that there is also a rpi-huw-image, but how can I add the xorg-xserver recipe? I tried making a new .bb file, but it complains that it does not have the LICENSE field set... any ideas? [21:52] <kraptv> that reminded me - I need to reboot my rpi as well, just installed a new firmware. [22:32] <Bozza> What are the command for wiring pi again? [22:51] <kraptv> Alright. I posted my system-info script on the RaspberryPi forum. [22:53] <Bozza> Wasn't there a command similar to GPIO readall? [22:57] <Bozza> Why is that? [23:04] <Bozza> The 0v pin is the fifth pin down right? [23:04] <shiftplusone> what are you doing? [23:05] <shiftplusone> do you have a schematic of what you're doing? [23:07] <shiftplusone> is.... is that a metal case? [23:08] <Bozza> Lol pi doesn't like metal? [23:08] <shiftplusone> Bozza, not just the pi, ALL electronics.... you're shorting things randomly! [23:13] <ShorTie> ok, now put a screw into it to hold it down, lol. [23:17] <Bozza> Do I need to change the +v and -v ? [23:22] <PfhorSlayer> what would you guys use to categorize mono vs stereo? [23:22] <PfhorSlayer> those are both... whats? [23:34] <Bozza> gordonDrogon: hey Gordon if I set the pins to pull up will they reset every time I reboot? [23:35] <shiftplusone> Bozza, that's not the correct way to wire switches. [23:39] <shiftplusone> Bozza, what happens when the switch is open? [23:39] <shiftplusone> Bozza, the pin is connected to a resistor and then what? [23:40] <shiftplusone> We're not at that stage yet.... it needs to be valid when the switch is open and when it's closed. [23:40] <Bozza> shiftplusone: so right now it is invalid? [23:41] <shiftplusone> yes, it's not connected to anything. [23:41] <Bozza> It needs to be connected to something? [23:41] <shiftplusone> not just something, but something that makes sense... like the circuit I found you. [23:42] <Bozza> What's the arrow on the bottom left? [23:42] <pksato> Bozza: connect one end of switch to gnd, and other to gpio pin. 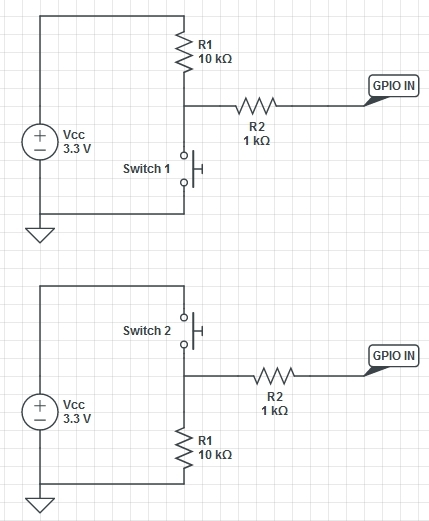 set gpio pin to input and enable pull up resistor. and read, if not pressed result is 1, if pressed is 0. [23:45] <pksato> some guys put resistor in serie with switch. [23:46] <shiftplusone> Bozza, in the top circuit, the resistor acts as a pull up resistor. It pulls the signal high (to 3.3v). When you press the button, that point becomes ground, pulling it low. [23:46] <pksato> this resistor is to prevent short circuit if pin is set to output and close switch. [23:47] <shiftplusone> Bozza, you might be getting confused because you're being told two different methods right now. [23:47] <shiftplusone> listen to pksato. [23:49] <Bozza> shiftplusone: could you modify my piece of art with paint? [23:50] <pksato> If you know that doing, not need any resistor, only switch. [23:51] <pksato> if now know, flow link of shiftplusone . [23:51] <pksato> if not know. [23:51] <pksato> is symbol for gnd, ground. [23:52] <pksato> other symbol for gnd is a inverted T .
[23:53] <Bozza> So vcc, gnd and 0v is all the same? [23:54] <pksato> gnd is a reference voltage, on digital circuit is 0v. [23:55] <Bozza> Oh and the switch will turn the pin from hi to low right? [23:57] <rikkib> Positive logic has one distinct advantage... When you power up the device you do not have things turning on while powering up. [23:58] <pksato> GND normaly is presente over all circuit, is more easy to access that vcc.